MKV stands for "Matroska Video". Matroska is a container file format, capable of holding unlimited number of video, audio and subtitile tracks, along with any metadata. MKV is open and free. No one holds patents or licenses and anyone can implement it freely. As a result nearly every software player and many hardware devices support it. The best software players out there (VLC, MPlayer ) have full MKV support and are absolutely free. Unfortunately MKV files can not playback in Motorola Droid X. How to convert and play MKV files on Motorola Droid X? For Motorola Droid X can not accept this format. Don’t worry, Aunsoft Droid X Video Converter (Mac: Aunsoft Droid X Video Converter for Mac) is such a useful and powerful MKV to Motorola Droid X Converter that can convert EVO, MKV, AVI, M2TS, MTS, MOD, VOD, DV-AVI, TOD, etc files to Motorola Droid X (*.mp4) with fast conversion speed, perfect video and audio synchronization, and high output quality. 2. Import MKV files to the program. You can add more than one file and could also check “Merge into one file to get a large one file. 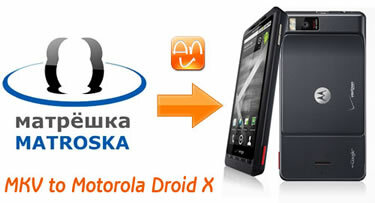 With this Droid X Video Converter, you needn’t worry about how to play MKV files on Motorola Droid X now. And you can also trim, crop your MKV videos and set Brightness, Contrast and Saturation of the videos. After the conversion is completed, you can put the converted MKV videos on your Droid X by follow this guide: transfer or copy movies and musics to Motorola Droid X.
Aunsoft Droid X Column, Put/play videos on Motorola Droid X, Convert AVI files to Motorola Droid X, Convert EVO to Motorola Droid X, Convert VOB Files to Motorola Droid X, Convert WMV/WMV HD to Droid X, Mount Videos to Motorola Droid X, Convert Blu-ray to Motorola Droid X, Convert M2TS to Motorola Droid X, Convert TiVo to Motorola Droid X, Convert MTS to Motorola Droid X, Transfer DVD to Droid X for Playback, Rip DVD ISO Image to Droid X MP4, Play DVD IFO in Motorola Droid X, Stream Droid X Videos to HDTV via DLNA, Play Droid X Gallery Video on TV via HDMI.